Thanks to Joe Federico for hosting this month’s meeting. 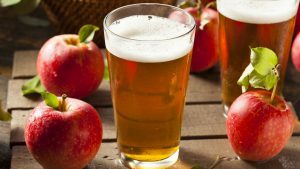 The competition was for ciders and meads – both of which seem to be growing in popularity exponentially. It was particularly intriguing and fun for a couple of reasons. First, it’s been more than three years since either beverage was part of a BURP monthly competition, and second, the competition followed a different format from other culture events, since it was combined with an enlightenment component. Many thanks to Janet Crowe, Bill Ridgely, and Wendy Aaronson for leading a group of interested BURPers in evaluating the cider entries and to Jamie and Paul Langlie for working with several BURPers in evaluating the mead entries. Terri Fischer gets a special nod of gratitude for pulling double duty and helping with both groups! Participant feedback on the format and the experience was extremely positive, so we’re likely to try something like this again in the future. The competition followed the 2015 guidelines for both ciders and meads, and there was a total of eight entries: four ciders and four meads. For the cider entries, there were three “new world cider” entries (category C1A) and one “cider with other fruit entry” (category C2B). For the meads, they ran the gamut with one traditional semi-sweet mead (category M1B), one stone fruit mead (M2D), one spice/herb/vegetable mead (category M3B), and one specialty mead- a braggot (category M4A). The top two entries from the respective groups were put forward to a best of show round. 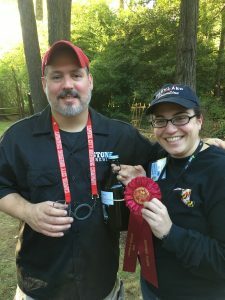 When it was all said and done, Dave White took first place with a braggot called “I Don’t Mean to Braggot”, while Hillary Sadoff took second place with her raspberry cider called “Berry-Jane Cider”. 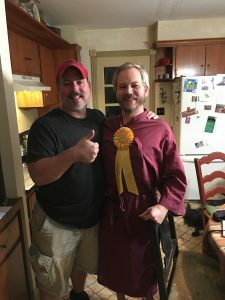 Joel Kalvesmaki took third place for his traditional semi-sweet called “Bee Sting”, and Bob Rouse received an honorable mention for his new world cider called “In Cider”. Congratulations to all the winners! See below for Dave’s braggot recipe. Next month is BURP’s Annual Real Ale Festival. Get more details here. Dave and Hillary celebrating their wins! Joel Kalvesmaki showing off his robe… oops! We mean ribbon. Started with T-58 yeast, but primary fermentation stalled out at 1.060 SG so added 1 pkg of Montrachet and finished at 1.040 SG.